The traditional marketing principles no longer work and marketers are on lookout for new ways of marketing every day. 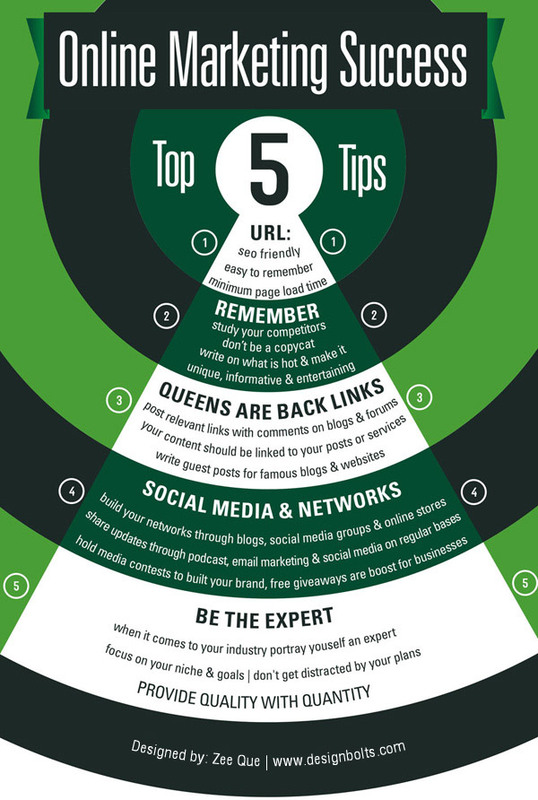 So what are the top 5 things you should know to make your online marketing campaign a success? Irrespective of the marketing strategies you choose, you need a website to receive the visitors and flock in from different sources. Unless the website is professionally designed and easy to navigate, the online marketing efforts cannot reap full benefits. Also look at the URL of your website. Is it easy to remember? Is it SEO friendly? Yes these things are small but do matter. Note the loading time of your website. Websites that are too slow to load often drive their visitors away. You can check it manually or choose one of the many free tools available online. Also make sure your website is duly tested for functionality as well as for content. It should be intuitively design so that the visitors can easily get what they are looking for. If you raise the expectations of the visitors through marketing and copywriting activities, make sure the website is able to live up to the expectations too. You must study the competition not to copy their style or their efforts but to see what makes you unique. No matter what business you are associated with, you are most likely to have good competition in the online world. Find out what makes you unique. Research on how you can add value to the marketplace. Build your own assets along the way. When you have something useful to share that is not available elsewhere, you will definitely have loyal customer base. Remember that the attitude of service first always results in success. Yes, back links are not just restricted to SEO activities. Whether you call it social media marketing or content marketing, links back to your own website or other relevant content of yours are always beneficial. There are many ways to do this. If you are writing a comment on some blog, you are allowed to give a clickable link along with your username. Similarly, if you are participating in a good discussion on a forum, people would definitely like to know where you come from and a link or two in the signature can do it for you. The same can also be done in blogging. You can very beautifully connect one post with another and the entire blog kind of flows along. This way, you do not let your audience go away after reading what you write but rather guide them to some of your own web page. This keeps them engaged. In today’s world, everyone is trying to build their own networks. Whether they are blogs, online stores or the local grocery store, they want to build a list and share updates with you. You can also do so. Add them to your social media accounts and keep them involved. But remember not to be too self-centered. Remember not to confuse engagement with spamming. Make sure you portray yourself as an expert in your field. Be human, be friendly, but when it comes to your industry, you are the expert. Maintain this posture and display enough knowledge to be able to carry it. Be focused on your niche and on your goals. With the right perspective and the right state of mind, success in online marketing could be a piece of cake. But it is important to keep yourself updated. What works today, may not work tomorrow. Similarly what worked yesterday does not work today. So do not try to push your product or service to the customers. Listen to them, identify their needs and let them buy the products or services for themselves.